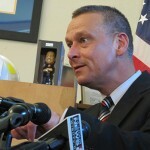 Current Florida Commissioner of Education Tony Bennett, who was Indiana's state schools chief from 2009 to 2013. When it appeared an Indianapolis charter school run by a prominent Republican donor might receive a poor grade, Bennett’s education team frantically overhauled his signature “A-F” school grading system to improve the school’s marks. Bennett, who now is reworking Florida’s grading system as that state’s education commissioner, reviewed the emails Monday morning and denied that DeHaan’s school received special treatment. He said discovering that the charter would receive a low grade raised broader concerns with grades for other “combined” schools – those that included multiple grade levels – across the state. Read Lobianco’s full story at The Huffington Post, in which the AP reporter tells the story of a “week-long behind the scenes scramble” to change the grading system. Lawmakers have already thrown out the current A-F model because of other concerns about the grading model’s makeup.